Random Thoughts of Gil Camporazo: Are You Frustrated for Unfinished Schooling? Are You Frustrated for Unfinished Schooling? USUALLY THE YOUTHS COULDN'T COMPLETE THEIR HIGH SCHOOL STUDIES due to considerable factors like poverty, transfer of residence, truancy, among others.But studies show even adults are also listed as one of those who haven't finished their secondary education. Our government has never left them unattended, especially the Department of Education. They have a special education for them. This is the Alternative Learning System or ALS. Those who are enrolled in this educational scheme are tasked to take their lessons in a module prepared for them. So far as to the latest results of those who took the A&E (Acceleration and Equivalency) Test. who were enrolled in ALS, many had passed. 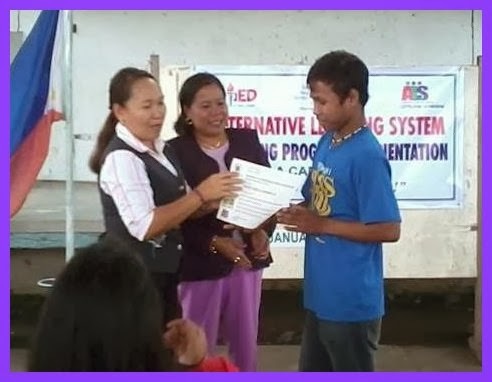 Recently, another class was launched in Barangay I (poblacion),city of La Carlota and our youngest daughter, Geeree D. Camporazo was the assigned teacher as Instructional Manager (IM). 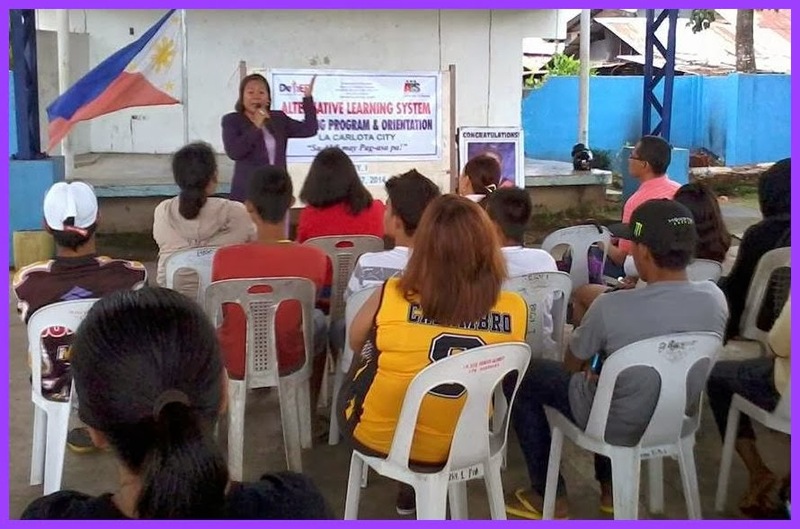 The simple program in the afternoon was attended by guests from our division office in the person of Ruth V. Villanueva, administrative officer ; Sonia B. Oplas, school principal in charged of the barangay; Armi T. Velasco, barangay kagawad incharge for education, and myself. Ruth F. Villanueva pointed out in her message that the success of this modular education for the OSY lies on the head, the heart and the dedication of every learner. It seems everything is provided for them, she told. 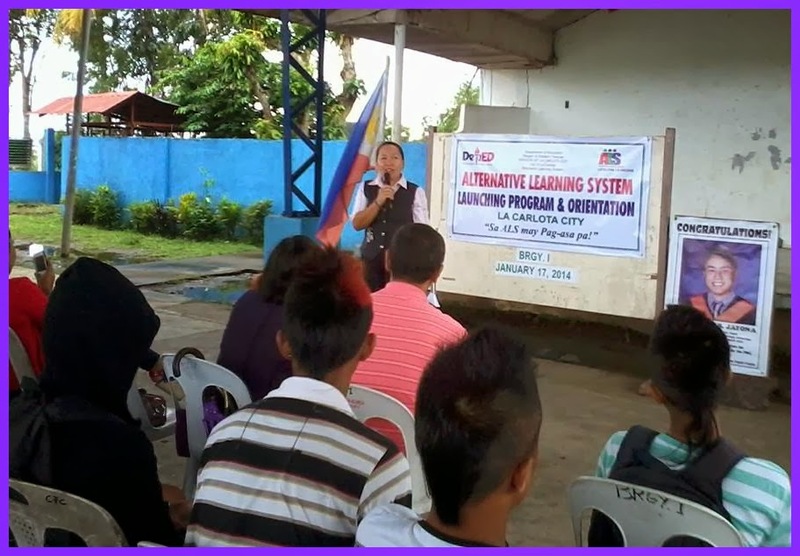 The division is providing them the mobile teacher, the Department of Education is providing them the learning materials, the barangay is providing them the venue for their scheduled studies. What they need to do is to have the attitude to complete this special education for them. 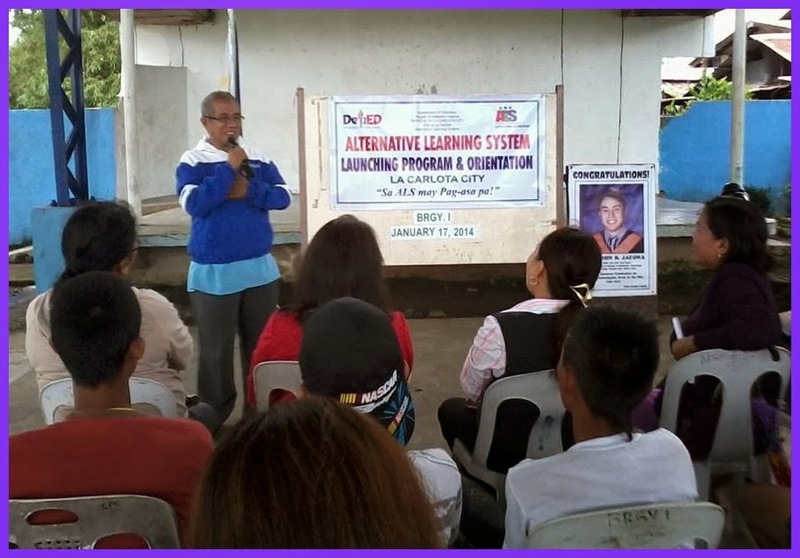 Sonia B. Oplas, the principal in charged threw challenge to the learners to do their best by using their head, by putting into their heart coupled with the determination to grab this opportunity offered for them by the DepED, through ALS. In return, their future, their lives later would be a better one. As supportive as ever to my youngest daughter, my presence is more than enough of making her happy. I did this for I how dedicated she is as I recall when she was still in her elementary grades on how she showed her best in dedicating herself to study and even summer break she did study her lessons without a teacher. She self-taught herself by reviewing what they had taken during school days. I also relayed to them how determined I was in completing my college studies for we're very poor but luckily due to my diligent, industrious and meticulous attitude while studying I was granted a full scholarship and finished my college course with flying colors. I had ambition in life that led me to be successful. I had my "head" put in a proper perspective to attain my plans and goals in life. I had my "heart" focused on the quality of education I wanted to have and I was not a failure then. All of these things were achieved because of my firm determination to succeed that poverty is not a hindrance, that money is not an obstacle to reach my ambition in life. I reemphasize the factors used by our administrative officer in her message that it is in the "head", in the "heart" and it is with "determination" that success could be reached by anyone else. With one's ambition serves as an encouragement to do whatever he wants for himself, for his family, for his community and for his nation as a whole. It is the right of every child to be educated by a quality education and your father is absolutely right for his belief for that. A good gesture of helping new generation of ALS method. The motivational matters must be taught to them in their willingness to study and learn. I know about the ALS a lot because we talked with the DepEd officers and staff for one whole year to develop the system and implement the project for them when I was in college for our thesis project. ALS can really help some youth catch up with their education. I remember Manny Pacquiao also availed the ALS examination. I have always believed that education is the best gift we can give to our children. I am so glad to know that your family is very much involved in educating people of all ages. I'm glad to hear another class was launched. In my opinion as long as our government keeps trying to provide ways to better our successors future, we can break the chain of having uneducated people. But of course there's a lot at play too. The students should be willing to learn too. Marami akong kilalang nagALs and they are good now. Nothing is impossible sa gusto matuto.